Appeals Court Says EPA Can't Keep Delaying Obama-Era Methane Rules : The Two-Way The U.S. Court of Appeals for D.C. notes the EPA can choose to rewrite a rule designed to prevent leaks from natural gas facilities. But it can't just put it off for two years, the judges decided. 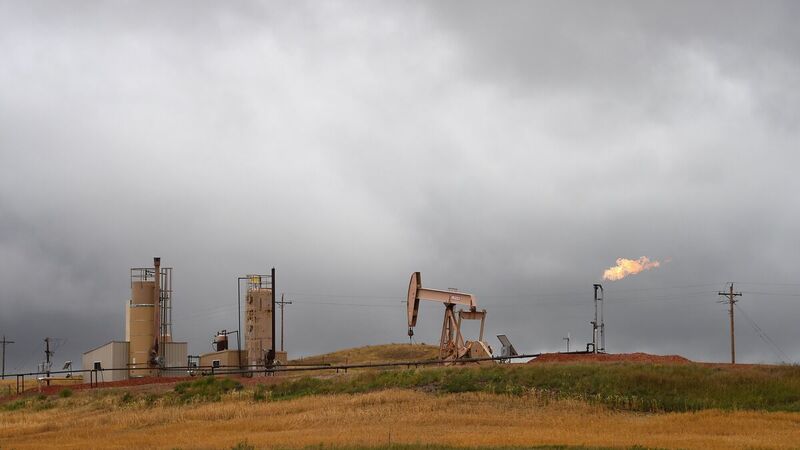 Pump jacks and a gas flare are seen near Williston, N.D., in 2016. The regulations in question are designed to prevent leaks at oil and gas facilities. Methane, which is released in natural gas leaks, is a potent greenhouse gas, contributing to global warming; other leaked substances are harmful for human health. During the Obama administration, the EPA crafted new rules, and the first deadlines for reporting and compliance were set for this summer. But then the Trump administration announced a temporary stay on the rules — first for 90 days, then for two years. Scott Pruitt, the administrator of the EPA, has expressed doubt over fundamental facts about climate change, like the central role that greenhouse gas emissions play in global warming. Before being confirmed, he promised to aggressively roll back regulations at the agency, and observers say he's been effective in fulfilling that promise. But the judges in the D.C. Court of Appeals ruled 2-1 that this time, Pruitt's rollback was erroneous. The EPA claimed that the stay was necessary because the oil and gas industry hadn't been given the opportunity to have input on some elements of the rules changes. Several environmental nonprofits disagreed, and sued. The judges ruled that oil and gas companies could have commented on the provisions in question — in fact, that they had commented about them, in writing, at the Obama-era EPA's request. In one case, the Trump administration pointed to an option for exempting pumps from regulation. Like the other provisions the EPA challenged, it hadn't appeared in the proposed rule but did appear in the final rule, which meant the oil and gas industry didn't get the chance to have any input on it, Pruitt's agency argued. The appeals court pointed out that the provision was actually suggested by the American Petroleum Institute, during the Obama administration's comment process ... which is why it didn't show up in the first proposal. "Even a brief scan of the record demonstrates the inaccuracy of EPA's statements," the judges wrote. The agency also said that because it wasn't a final decision on the rule — just a two-year stay while the EPA "reconsidered" the regulation — there was nothing a court could do about it. The judges weren't persuaded, saying that such a lengthy delay is "tantamount to amending or revoking a rule." Another set of federal methane regulations — covering emissions on federal or tribal lands — narrowly survived a challenge in the Senate in May. An effort to roll back the regulations failed 49-51, with Republican Sens. John McCain, Lindsey Graham and Susan Collins joining Democrats to keep the methane measure in place. As NPR's Christopher Joyce reported earlier this year, the concentration of methane gas in the atmosphere was relatively constant for years but has been increasing noticeably within the last decade. There are multiple sources: sewers, manure pits, livestock, rice fields, natural wetlands. The oil and gas industry emphasizes that the biggest sources are agricultural and natural — while environmental scientist Rob Jackson told NPR that the contributions from fossil fuel industry appear to be rising. Industry representatives note that there are voluntary efforts to reduce leaks as well. After all, it's not just greenhouses gas emissions or air quality that's at stake. "Methane is a commodity," Christopher notes, "and leaked methane is money lost."